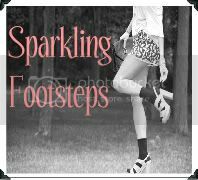 I'm so honored to be featured on Sparkling Footsteps today. Don't you just love that name!? It is so descriptive of how one might walk through life. Not heavy, not soft, not loud; but sparkly. It is my hope to kick off a little glitter with every step I take, to leave a faint trail of magic and beauty behind me. Do you hope for that too? So, please stop by her blog and say 'hi' today. And tomorrow, and the day after that, cause Lindsay is cool. And beautiful. And stylish. And, she has a recipe for "healthy" mac and cheese. Now, who doesn't want that all around goodness!? congratulations! i love her blog! My favorite lines "Not heavy, not soft, not loud; but sparkly. It is my hope to kick off a little glitter with every step I take, to leave a faint trail of magic and beauty behind me." Um, that is super cute! I want sparkly steps! Can't wait to check it out! adorable post! What clip in extensions do you use?? I am thinking of getting them! Your post was so inspiring and helpful...blogging does take so much time and effort but the reward is truly amazing! I am loving meeting everyone and can't wait to see what everyone posts everyday! You my friend are one of them! Keep it up and thank you for inspiring me! Oh I love love your comment on keeping things positive. Big virtual hug for that sentiment. Just love your blog! You have a new follower! !